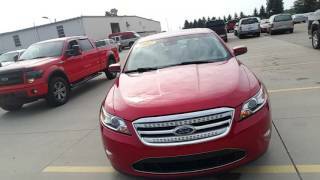 The Ford Taurus SHO 2012 is powered by a 3.5-liter twin-turbocharged EcoBoost™ V6 engine. This advanced unit generates 365 horsepower at 5,500 rpm and 350 lb.-ft. of torque from 1,500 to 5,250 rpm, resulting in significantly improved power, torque and fuel economy compared with larger, normally aspirated engines. New for 2012 is also an addition of "Ginger Ale Metallic" to the Taurus SHO color options. 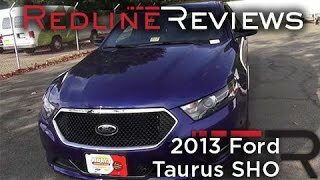 The Ford Taurus SHO returns for 2012, delivering on the premise that high performance and responsible fuel economy need not be mutually exclusive. A new hue for 2012 – Ginger Ale Metallic – is added to the Taurus SHO color palette. The legendary SHO formula calls for unique exterior design cues including premium painted aluminum wheels wrapped in standard low-profile tires, a decklid-mounted spoiler and twin chrome exhaust tips. The car also features a uniquely finished interpretation of the Ford signature three-bar grille with SHO-specific parking lamp bezels. The SHO interior encourages performance driving. Leather-trimmed seats with Miko® suede inserts, made with recycled post-consumer yarns from plastic soft drink bottles, are both comfortable and luxurious. A perforated leather-wrapped steering wheel puts the driver in smooth touch with the road. Front seats are 10-way power adjustable. SHO accelerator and brake pedals are trimmed in aluminum. The console, instrument and door panels feature SHO-specific authentic aluminum appliqués. SHO branding appears on the unique floor mats and on the passenger side of the instrument panel. Taurus SHO features an advanced electric power-assisted steering (EPAS) system providing responsive road feel and enhanced on-center balance. SHO also features a sport-tuned suspension with unique shock absorbers, springs, stabilizer bars and strut mount bushings specifically developed and harmonized to deliver the highest level of road-holding, cornering agility and steering responsiveness. Taurus SHO takes full advantage of Ford’s multilink SR1 rear suspension design. Named for the 1:1 shock absorber ratio, this configuration provides an inherently stable base for the SHO development team to fine-tune for enhanced driver control and agility. In addition, the SR1 rear suspension geometry provides increased travel, while enabling the use of 19- and 20-inch wheels and tires. 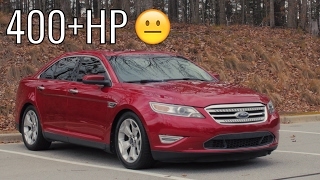 For the discriminating enthusiast, Taurus SHO can be specified with an available SHO Performance Package consisting of upgraded brake pads, recalibrated EPAS for even more responsiveness, a sport mode setting for the standard AdvanceTrac® with electronic stability control and a shorter 3.16 to 1 final drive ratio for faster acceleration. In addition, it has 20-inch Goodyear Eagle F1 summer-compound performance tires with premium painted wheels. 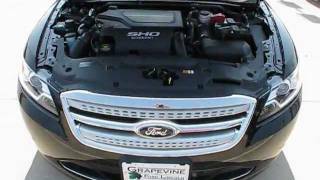 The foundation of the 2012 Taurus SHO is a 3.5-liter twin-turbocharged EcoBoost™ V6 engine. This advanced unit generates 365 horsepower at 5,500 rpm and 350 lb.-ft. of torque from 1,500 to 5,250 rpm, resulting in significantly improved power, torque and fuel economy compared with larger, normally aspirated engines. A key feature of this EcoBoost engine is gasoline direct injection. The direct injection of fuel into the cylinder during the intake stroke, as opposed to port-style injection to an externally mounted intake, produces a well-mixed air-fuel charge. Fuel vaporization during the intake stroke cools the incoming air, improving volumetric efficiency and lowering the likelihood of knock. The new Taurus SHO driveline combines a high-capacity six-speed SelectShift Automatic transmission with a sophisticated torque-sensing all-wheel-drive system. These components work in harmony to deliver ample traction when putting EcoBoost power on the road. The six-speed transmission offers a wide array of gears to enable spirited acceleration, yet comfortable and economical high-speed cruising through a 2.77 to 1 final drive ratio. It provides conventional automatic operation or a manual shift mode that gives the driver the option of timing and control of gear selection. For performance-minded drivers, paddle controls allow match-rev downshifts and will hold manually selected gears for precise control. Intuitively operated, a push on either paddle will deliver an economical upshift under acceleration, while a gentle pull forward brings a smooth downshift, synchronizing the engine and transmission speeds for responsive, positive engagement. The Taurus SHO driveline uses a sophisticated all-wheel-drive system that engages automatically and unobtrusively. The unit contains an advanced array of internal electromechanical clutches to efficiently distribute torque to the wheels with optimum traction. The 2012 Taurus SHO is built at Ford’s Chicago Assembly Plant.